of the legacy of the Harriet E. Richards Cooperative House, founded in 1928. Register online through Friday, April 5th. We hope to see you at the 2019 Alumnae Tea! In Boston early for the Alumnae Tea? Swing by Sunset Cantina to grab food and drinks with fellow alums. HER House folks will be there Saturday, April 6th starting at 7pm. Sunset is located at 916 Commonwealth Ave.
Join us for our annual celebration and meeting. Additional Information: Loved ones are welcome. Please let us know of any accessibility needs and dietary restrictions at heralums.191@gmail.com or (617) 396-4371. Interested in nominating yourself and/or someone else for the 2019-2020 HERAA Board? Read more about each position in our By-Laws and then nominate yourself and/or someone else through this form. Online nominations will be accepted until Sunday, March 31st. Additional in-person nominations will be also be accepted during the Alumnae Tea on Sunday, April 7th. 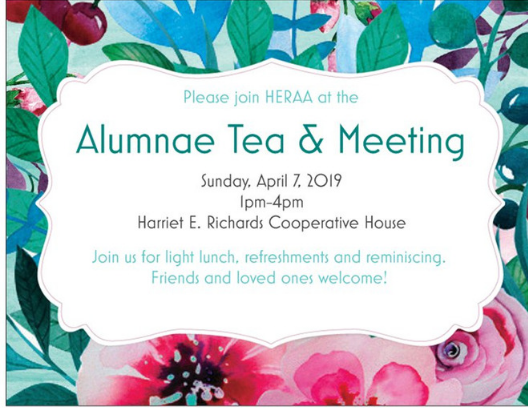 Nominees do not need to be in attendance at the Alumnae Tea to run for office, but election remarks should be submitted to HERAA by March 31st to be shared on the nominee's behalf. Using public transportation is highly encouraged. Please note that there are performances at the Boston University Agganis Arena during the afternoon throughout the weekend that coincide with our various events. There will be limited street and commercial lot parking available on or near campus. BU has several parking lots on campus that will be open throughout the weekend, but will have event pricing on Saturday and Sunday afternoons. BU alumni receive a 50% discount in all BU parking lots, even during Red Sox games. A list of available parking lots, including maps, can be found here. BU alumni must have an alumni card – no exceptions – to get the discount. Alumni can get a free card here. BU has compiled a comprehensive list of area hotels; you can access that here. If you are a local alumna and are available to host out-of-town alumnae or an out-of-town alumna looking for a local host, please contact HERAA. HERAA cannot guarantee we will be able to secure a homestay for visiting alumnae; please have alternative accommodations available. Any questions? Email HERAA at heralums.191@gmail.com or call us at (617) 396-4371.